I've started using sous vide chicken in my parmigiana and it makes the whole process so much easier. It removes all the guessing from the frying of the crust and you can just focus on making it super crispy. This recipe is also in our new book, available at Amazon.com Sous Vide: Help for the Busy Cook or as a full-color PDF. 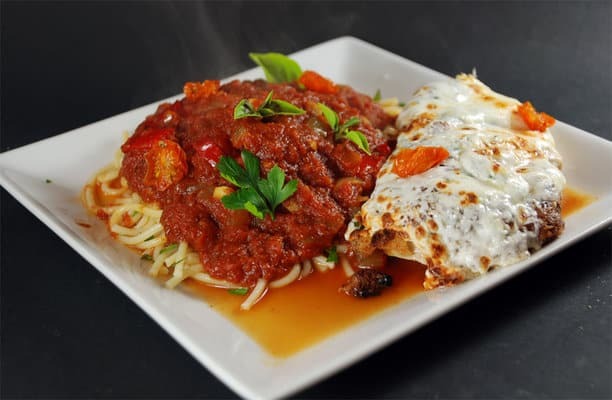 Making sous vide chicken parmigiana is a multi-step process but using pre-cooked chicken makes it easier and stress free. You start by cooking your chicken breasts sous vide for a few hours at 141°F / 60.5°C then remove them from the water bath. I like a higher crust to meat ratio so now I normally cut the chicken breasts in half, but you can use them whole if you like. At this point you can refrigerate the sous vided chicken breasts until you are ready to make the meal. When you are ready to finish the sous vide chicken parmigiana you prepare a typical battering station with flour, beaten eggs, and in this case seasoned Italian bread crumbs. The coating you use is completely up to you and you can replace the bread crumbs with panko crumbs, breading, or just seasoned flour. Dredge (cover well) each sous vide chicken breast with the flour, dip it into the egg, and then roll it in the bread crumbs until it is nicely coated. Set it aside on a plate and repeat for each breast. Heat some oil in a pan, about enough to come halfway up the chicken, and sear the sous vided chicken breasts in it until they turn a nice golden brown. Place the seared breasts on a sheet pan, top with basil and mozzarella and parmesan cheeses. I prefer fresh cheeses but shredded will work fine as well. 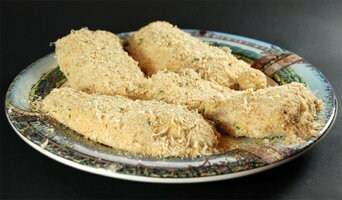 Cook the sous vide chicken parmigiana under the broiler in your oven until the cheese is bubbly and then serve. I love them with a side of spaghetti or angel hair pasta with marinara sauce. 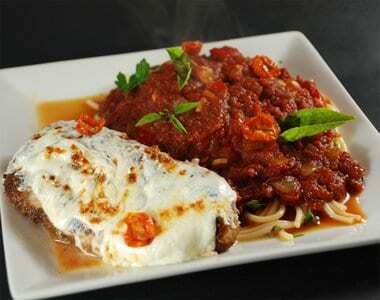 I hope you can now enjoy some sous vide chicken parmigiana of your own. This recipe is from our new book, Sous Vide: Help for the Busy Cook: Harness the Power of Sous Vide to Create Great Meals Around Your Busy Schedule which is filled with fast and flavorful meals that even the busiest cook can make during the week! Salt and pepper the chicken then sprinkle with the garlic powder. Place in sous vide pouches with the thyme and rosemary and seal. On the morning of the day you want to eat, preheat your sous vide water bath to 141°F / 60.5°C. Place the pouch in the water bath for 2 to 12 hours. Preheat a pan to medium-high heat. Preheat the broiler on the oven. First you will want to set up three stations for the breading. Combine the flour, salt, and pepper on a plate. Beat the eggs into a wide mouth bowl. 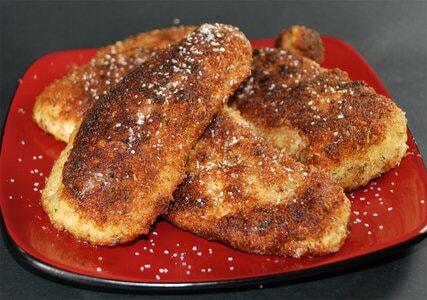 Combine the bread crumbs, parmesan cheese, and parsley on another plate. Remove the chicken from the pouches and pat dry. Dredge the chicken in the flour, then the egg, then the bread crumbs. Add about ?? of oil to the pan and heat to about 350°F to 375°F (176°C - 190°C). Sear the dredged chicken breasts until the crust becomes golden brown, flip and repeat on the other side. Remove from the heat and set on a sheet pan. Top each one with the basil and cover with the mozzarella and parmesan cheese. Broil in the oven until the cheese is browned and bubbly. Remove and serve. This recipe is from our new book, Sous Vide: Help for the Busy Cook: Harness the Power of Sous Vide to Create Great Meals Around Your Busy Schedule which is filled with fast and flavorful meals that even the busiest cook and make during the week!